Imagine if you could suddenly spot hundreds of errors in your books that were missed by human editors! However wonderful your book is, if you have more than a small number of typos, your online reviews will reflect it and you’ll lose some of the impact of good reviews. This translates directly into a hit on sales. It’s galling to put your heart and soul into a book, only to find people are distracted by punctuation problems and duplicated words. Getting all the mistakes out of a book is hard. As the editor of my wife’s novels, I know the frustration of completing an exhausting edit, only to find that there are still problems I missed: phrases that could be expressed better, repeated words, missing quotation marks, and so on. Automated tools can only find a certain proportion of errors, of course – and in my experience it still takes about six passes to be confident of a high-quality book. I’m sure it varies from one editor to another, and one author to another. But, you can use Jutoh to find an astonishing number of typos that you could easily miss. The human brain is wired to ignore a lot of errors – which is, thankfully, why readers aren’t more annoyed with typos than they already are! But you can bet that what you miss, someone else will notice. OK, but how can Jutoh help? Spell-checking is provided, which can find a lot of typos. But Jutoh Plus (to which you can upgrade, for a modest sum) also has the concept of custom compile messages, powered by customised Find and Replace presets. 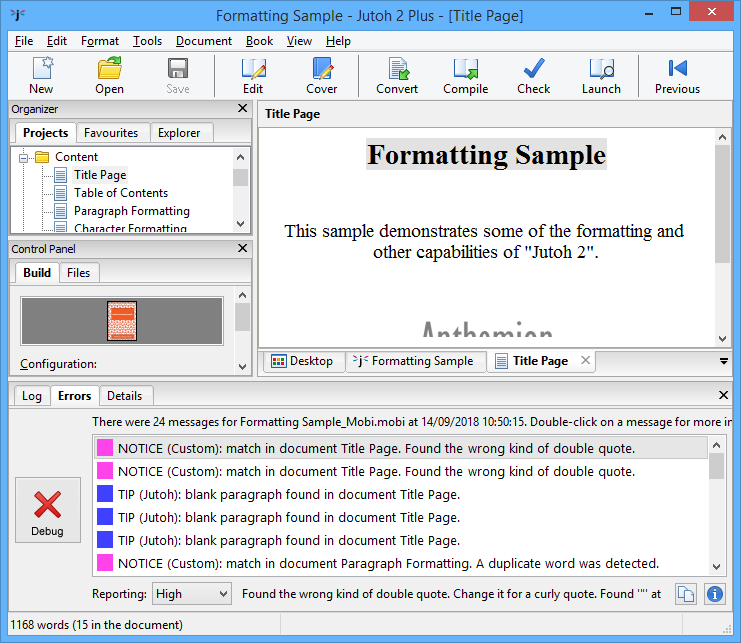 This means that when compiling a book, Jutoh will check the ‘find’ part of your Find and Replace presets and if it finds a match in a paragraph, a message of your choosing will be shown. 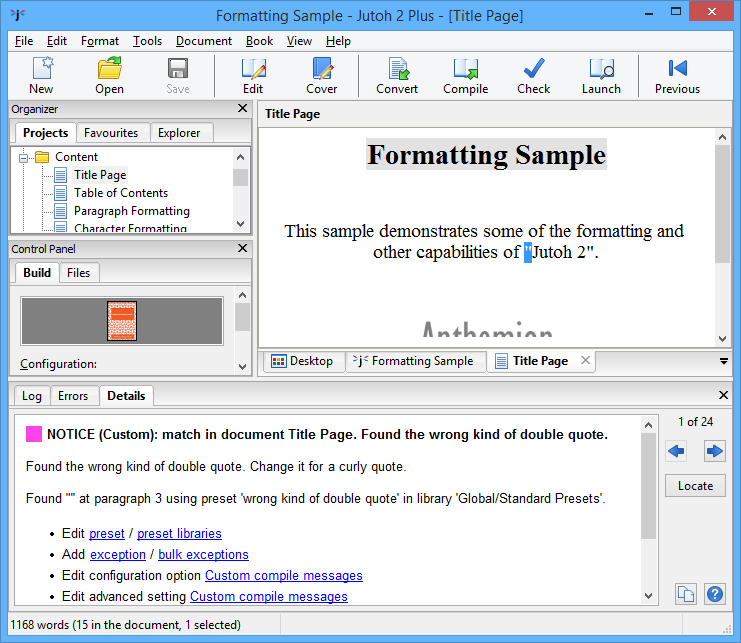 So now, when you compile your ebook, not only do you see any formatting problem tips, you see problems with your content too, such as missing punctuation, duplicate words, clichés you’re too fond of, common synonym typos such as “broke of” or “lent forward”, bad capitalisation of Bible, and so on. Double-click on each message and you can see where the problem is in your book, and correct it. 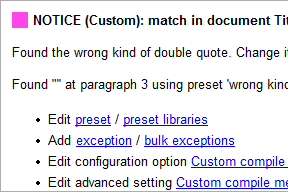 When you manually find a typo that might be repeated elsewhere, you can add it to your presets, so it can find the same problem in other chapters and other books. As you build up your preset library, you can apply it to your older books, and find further typos. Fortunately, ebooks – unlike print books – allow gradual refinement! Sometimes, a preset can’t be guaranteed to match against a typo and not against valid text. For example, you might check for “year old” to catch unhyphenated usage such as “ten year old”. But it’s perfectly valid to say “I was less than a year old”. Jutoh can deal with these ‘false positives’ – just click a link in the compile message to add an exception, which will match this unique paragraph text. The next time you compile, Jutoh will ignore this instance. The exception is stored in the project so you don’t lose this information. You can define presets per-project, or globally for all projects. 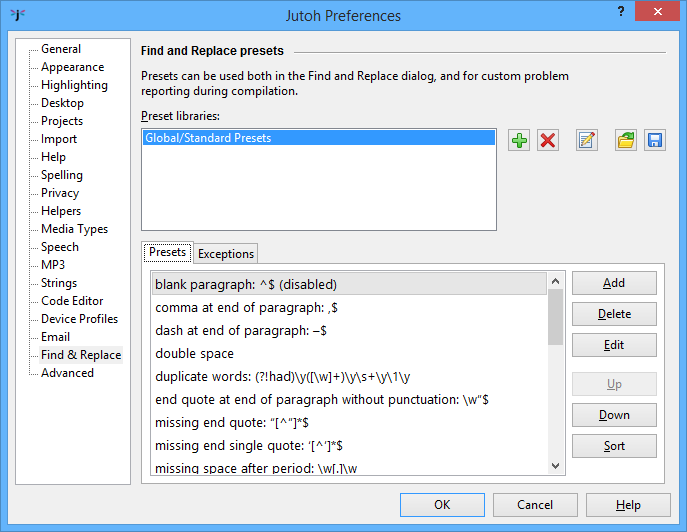 Jutoh provides a set of default presets for finding common errors: click Options on the toolbar, then click Find & Replace. You should see the preset library “Global/Standard Presets”. Some may be applicable to your books, and some may not, so you can edit the inapplicable ones and clear the Enabled control so they won’t be considered, or you can delete them. Here we’re searching for a straight double quotation mark and reporting it, since all quotations marks in a book should normally be left or right curly quotation marks. To enable custom compile messages, set an advanced option to the name of the preset library (or libraries). Click Options, then Advanced, and search for “Custom compile messages”. Click on the drop-down arrow and choose “Global/Standard Presets”. To use an exception list in the project (since exceptions are normally project-specific), you can change this to “Global/Standard Presets|Project/Exceptions”. Then click OK.
You can correct the problem in the text and go to the next error; then compile again to see if you’ve fixed all the problems. 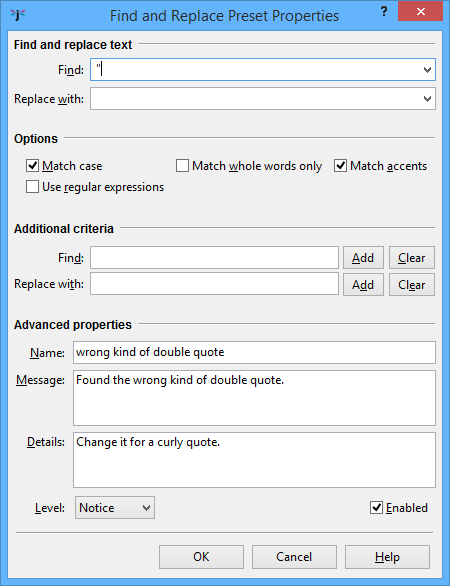 For more information on how to use this feature, please search for “custom compile messages” in the Jutoh toolbar. We hope you agree that this is a terrific time-saver and will increase the quality of your books.